Best advice I ever received: Lighten up! On her first trip to Europe, Karen Gros was a young advertising executive traveling alone for six weeks, guided by Rick Steves’ then-recently released Europe Through the Back Door. She hit as many places as she could in that time — England, France, Italy’s Cinque Terre, Spain and Portugal — and though Steves’ book on how to travel internationally and not seem like a tourist is popular now, Gros was on a quiet path not yet crowded with Americans. “I was one of the only people on the trail, and I remember thinking, ‘These little villages are incredible. These people live without cars! '” Gros says. Her advertising client at the time was Nissan. “Here I am working for a company trying to convince people that they need cars and … [I see] there are beautiful ways to live without all this stuff that we’re told that we need. American culture and societal expectations loosened their hold on Gros, and when she returned, she and Patrice, her then-boyfriend, moved out of their apartments and on to a boat. Each day began with a run along Marina Del Rey, a quick stop at the local shower house and a walk to the ad agency, where she continued to convince people to buy cars. Soon into their altered life, Gros quit her gig at the agency, Patrice quit his stint in finance, and the two moved away to begin Patrice’s next chapter as an organic farmer. Little did she know, it would lead to a life as culinary instructor and European tour guide. 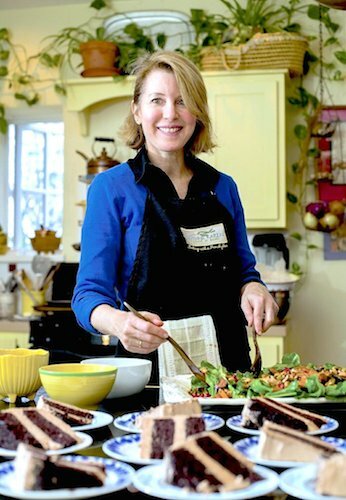 This marks Gros’ 12th year as owner of “Cuisine Karen,” her business of French-inspired cooking and demonstration classes that she puts on for folks from her Provencal-style home in Eureka Springs. Each class uses local ingredients, often produce and meat grown on Foundation Farm, which Patrice owns. “She became in tune with the farmers’ market scene … which is a different world,” says husband Patrice Gros. “She probably has more commitment to organic than I do. Sometimes I find myself cutting corners, but she doesn’t compromise. “Karen makes you feel very welcomed in an otherwise sort of intimidating situation, especially with travel and culinary classes,” says Karen Knowles Zuniga, Gros’ friend and owner of Electric Venue Chef in Los Angeles. “She’s one of those rare people who are so warm and welcoming that you feel comfort and joy from the moment you meet her. Lately, Gros’ reputation has grown as she’s done more chef dinners in private homes and taken on more culinary team-building for well known companies that have offices in the area, such as Procter & Gamble, ExxonMobil and Walmart. Many of Cuisine Karen’s cooking class guests are regulars. Several attend most every class, and some have been visiting from the start. As a one-woman show, Gros doesn’t mind keeping it relatively small. A regular group of 15 showing up on her doorstep once or twice a month fills her home and is enough to keep her busy. But there’s something to that loyal customer base. Gros’ kitchen and cooking style is seemingly simple and accessible. There are no elaborate gadgets or expensive and mysterious items around to inspire guests to go shopping after the conclusion of the class. And if there is a tool that maybe not all have, Gros shows them how to make do without it. “I took half a dozen of her classes, and I still use all those recipes,” says longtime friend Mary Tait. “It’s amazing…[because when I do] everyone thinks I’m a good cook. “She’s a good teacher, one who has a good blend of economy and empathy. It requires her to be ‘on.’ What most may not know is that after those classes, she goes upstairs and takes a nap” — a testament, Tait says, to the amount of energy, attention to detail and empathy Gros exerts with each session. And though Gros can pull out the pastry-wrapped tenderloins, salmon and other gourmet dishes when it’s time to entertain, her main goal is to make food that people can easily learn to make and love to eat. More than seeming easy (or tasty) enough to give it a shot, each class comes with specific tips for finding good foods. Best, Gros says, is from your own garden, local farmers’ market or neighbor. Second best is natural food stores. And all the rest is very selective. As a longtime follower of Sally Fallon, author of Nourishing Traditions, whose food basics direct people to eat animal products, “full” or “healthy fat” foods and whole grains, Gros’ cardinal rule for food is to make what is in season. That means doing some unintuitive things for amateur chefs, like forgetting about tomatoes for the length of winter (unless you have canned them yourself), leaving out dill in summer and only eating fish if you buy it frozen or reel it in from the creek. Northwest Arkansas, Gros says, is an excellent place to depend on local suppliers for poultry, lamb, pork and beef, eggs, cheese and raw milk. Its ideal location for a garden is just what Gros recalled when, at seven months pregnant, she and Patrice left their hamlet in the south of France to be closer to her parents. Karen Gros grew up in Tulsa, Okla., where she generally took sanctuary in a tree house made by her father, an architect. As an only child, she sought entertainment within nature, always walking around the pond, carting a doll over to a neighbor’s house for a visit and jury-rigging a Playmate cooler into an elevator for her cat to join her in the treehouse. Throughout high school only French class piqued her interest, and it was psychology and philosophy that fascinated her most during semesters at Oklahoma State and Tulsa University. At the advice of her parents, Gros entered advertising as a practical means of making a living. But before a path was settled, she met a baseball player from California. To encourage better grades, her parents made a deal: if she came home and improved her grades at Tulsa Junior College and TU, she could finish college anywhere in the country. In 1987, Gros graduated with a degree in business and marketing from Loyola Marymount University in Los Angeles, and spent several years at Chiat/Day advertising. More crucial to her worldview was that first international travel. “I learned more about my own country when I first traveled to Europe at [age] 26 than I learned in any classroom,” Gros says. “You never really can know yourself until you know how others perceive you. In a way, it was a lesson in independence and self-sufficiency, too. She and Patrice were on a brief breakup, and Gros felt strongly that a six-week journey to see the world could do wonders for her perspective. She asked Chiat/Day for three weeks vacation and three weeks unpaid leave, but they refused. Gros quit, and while traveling, Chiat/Day secured the Infinity account. She knew she would have a job to return to. It was on another solo trip some years later that Gros realized her unique position. As the wife of a Frenchman and with a personal love of travel, she could lead Americans through France like a local while being sensitive to the individual needs and hopes of a small group. Gros planned a month-long trip to visit the French side of their family and had arrived a week early to spend some time with her best friends while they visited Paris. Back home in Eureka Springs, Gros had taken African drumming and dance class with Kouakou “Angelo” Yao, who began taking people on month-long trips to Africa. For over 10 years, Gros has guided 25 tours through Paris and inland Provence, mainly, as well as Guérande, Brittany and Normandy. In recent years, she began including new adventures in Greece and Turkey, at the request of her regular clients. Each one is a little more than a week — usually eight or nine days, with the option to stay longer. From a guest standpoint, all they have to do is show up at the airport, while Gros handles all trip planning, logistics and itinerary. “Karen should be very proud of the extreme level of professionalism in everything she does,” Patrice Gros says. “Her trips are unbelievable, and I see what she does at home. The amount of preparation is mind boggling — months of phone calls, emails and essentially the one-week trip comes down like a recipe. Early iterations of these tours were a blend of classic French sightseeing and quirky, off-beat activities that Gros hoped would lend a fresh and interesting side to travel that Americans would likely otherwise miss. There was the old cabaret in Montmarte, Picasso’s favorite location, famous for its theatrical French sing-alongs and cherry liqueur, but it wasn’t as fun for non-French speakers. There were concerts and exhibits at the National Museum of the Middle Ages, but that fell flat for Gros’ audience. And in an attempt to incorporate a stronger cooking element to the trips, those first tours included a daily group breakfast in Gros’ apartment. But a couple trips in, she realized people prefer to start their vacation days on their own timeline. That led to a more well-rounded, nail-on-the-head experience down the road as Gros used the honest feedback to improve the trips. Instead of having a daily breakfast, guests get their foodie experience elsewhere in the locations that Gros selects for them to visit and through a dinner by a local chef, typically Laurent Veyet, a well-known private chef, inside a local French home on the concluding night of each trip. It’s a different way to experience world culture, when instead of walking from the Louvre to Notre Dame you make your way between one meal to the next, experiencing the varied disciplines, flavors and traditions around meal time. Traveling the world, guests work their way through the escargot, purple artichokes, patés, herbs de Provence and tarragon dishes of France; the fish, vegetables and fresh yogurt of Greece. Copyright 2016, Arkansas Democrat-Gazette. Reprinted with permission.